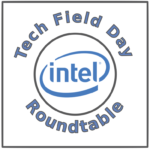 This video is part of the appearance, “Tech Field Day Roundtables at Intel Cloud Day“. It was recorded as part of Tech Field Day Roundtable at Intel Cloud Day 2016 at 14:45-17:15 on March 31, 2016. In this roundtable, the delegates discuss NVM Express (NVMe) and how it holds the potential to change the landscape of storage for IT professionals in the near future.